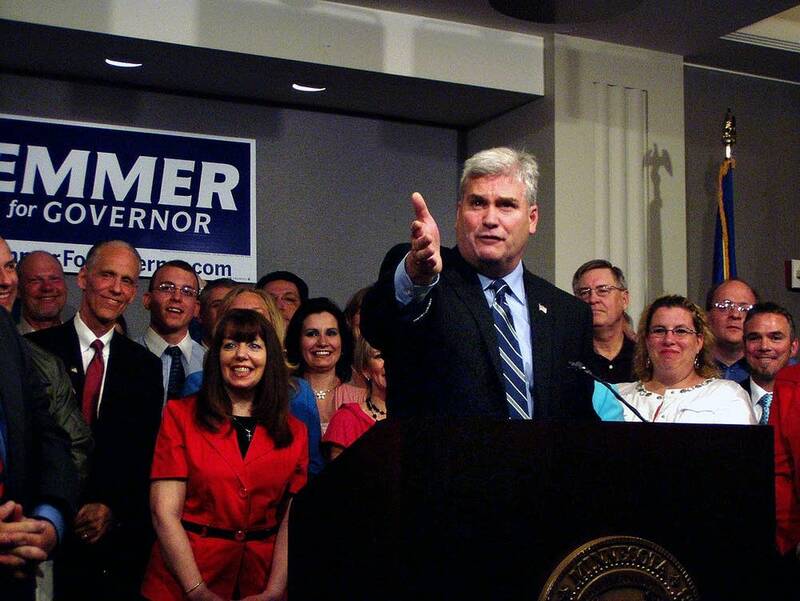 A week after igniting a firestorm over restaurant worker pay, Republican gubernatorial hopeful Tom Emmer on Tuesday proposed eliminating Minnesota income taxes on some tipped wages. Emmer, who last week suggested that tips be factored into the hourly pay of minimum-wage workers, issued his new plan a day ahead of a town hall meeting with wait staff designed to soothe their concerns. Emmer's proposal would exempt the first $20,000 a server makes in tips from state taxes. He said such a move would help create jobs in the hospitality industry. "Let's not tax their tips. Right now they're taxed on both the hourly wage they receive, plus the tips they receive," said Emmer. "Let's eliminate the tax on the tipped wages, because it's a nightmare, I think, to track anyway. More importantly -- what it does for somebody who earns $20,000 in a year, it puts another 500 bucks in their pocket." Emmer is also proposing new tax breaks for restaurant owners. Emmer has been doing damage control since suggesting that Minnesota enact a provision commonly called a tip credit, which can drive guaranteed hourly pay below the standard minimum wage. He has since issued several clarifications, set up the public forum and spent a night waiting tables at a St. Paul restaurant. The tip-credit provisions in most states - opponents call them tip penalties - allow businesses to pay workers less than the minimum wage if they earn tips. Federal law allows states to drop the minimum wage for tipped employees to $2.13 per hour, although Emmer never said how he would fashion his credit. In Minnesota, restaurant workers are entitled to the minimum wage and also collect tips. Minnesota's minimum wage is $5.25 for small employers and $6.15 for large employers, based on annual sales. Emmer's campaign estimated his proposal would save eligible workers - and cost the state treasury - up to $17 million. He didn't quantify the size of the other tax cuts. Minnesota's next governor will confront a multibillion-dollar deficit out of the chute. The state Department of Revenue wouldn't confirm or refute the figures because not all tipped workers report their income in the same way, said agency spokeswoman Kit Borgman. The plan was immediately criticized by Independence Party candidate Tom Horner, who said it would be unfair to allow workers from one industry to shield a substantial portion of their income from taxes. "It's a pandering response to a political crisis that he brought on himself," Horner said. Democrats didn't immediately weigh in on the Emmer plan, but have called for raising the minimum wage. Emmer has all but sealed up the GOP nomination, facing only token opposition in an Aug. 10 primary. Still, the tip issue has put him on the defensive. Emmer's campaign didn't give notice of his shift as a waiter over the weekend. But it released video footage late Monday showing him carrying drinks, filling chip baskets and serving platters at the Ol' Mexico Restaurante in St. Paul. In the video, Emmer accuses the media of misrepresenting his position, saying: "We're not talking about reducing anyone's wages." As a freshman legislator in 2005, Emmer introduced an amendment to repeal the state minimum wage. "This is a true form of socialism," Emmer said at the time. "We need to allow the market to work." But he withdrew the proposal before a vote. Democrats and labor unions have hammered Emmer over the minimum-wage fracas, saying his tip stance would punish low-paid workers. The Democratic-endorsed candidate, Margaret Anderson Kelliher, quickly proposed increasing the minimum wage by $1.50. Democrats Mark Dayton and Matt Entenza, who also are running for governor, said they too would raise the minimum wage. The Mexican restaurant where Emmer did his shift will host his forum. It's owned by Republican donors, and one family member is recorded as having given to Emmer's gubernatorial campaign. Emmer's campaign has said the forum will be open to anyone.